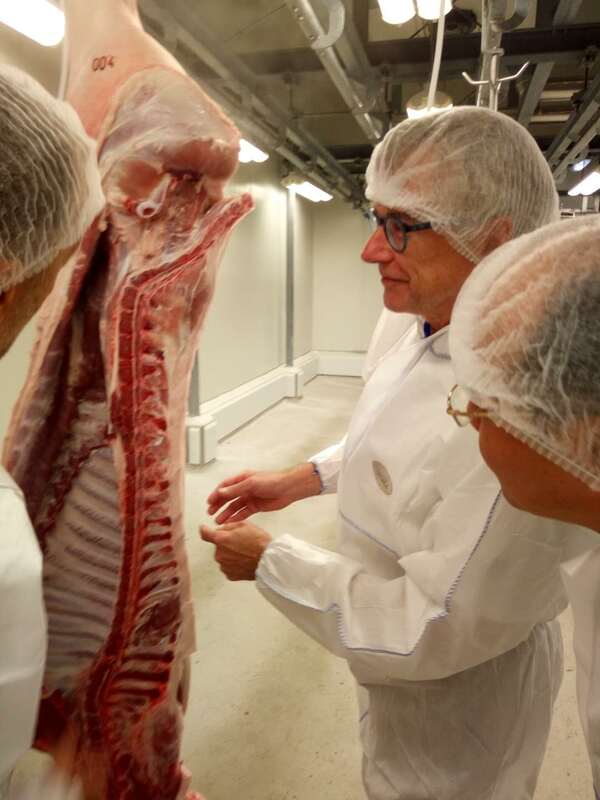 During a study tour I organized recently with managers from Guangzhou (GKAH, a big producer of pigs), I learned that the price a producer in Germany gets for a kg of pig meat is between 1,50 and 1,80 Euro. This is the economic side of bad meat, too lean, too dry, raised with too much energy input and even doubtful veterinary methods. But consumers are used to buy pork for between 3 and 8 Euros per kg. I don't want to comment on the value chain problems, that more money seems to stick to the commerce than to the production. I want to point to the problem! My friend Andrea, who is my supplier of pork cannot sell for less than 6 Euros/kg, if you take the entire body, this means 15 Euros/kg for the more noble parts. As his pigs are raised completely free ranging, I have the feeling that his prices are still too low, but there is market pressure even in the niche areas. We have a real problem: meat is too cheap, consequence bad quality, other consequence: People loose the consciousness that meat is the top, the extra of daily nutrition, and they eat too much of it. We have a real problem, it is a health problem and an economic problem. We need ideas how to handle it. But the country (speaking about Germany) that would have the economical and intellectual resources to tackle this problem goes astray. An example: For uncounted times farmers do castrate male pigs, when they are young. This is necessary, because meat from mail pigs stinks, if you do not castrate them in time. Still in the 50s it was a bit of a brutal operation, because it was done, when they were some months old. Nowadays it is done in the very early weeks of their life. It i s sure not a nicety, but is the treatment with carbon dioxide before slaughtering a nicety? The gasification with CO2 before slaughtering is completely legal (and I have no objections). The castration of little male pigs in Germany is illegal from January 2019 on, if done without narcotization. Nacotization in Germany can be administered only by a veterinary by law. Do you see the problem? The madness of urban middle class, who most probably never have seen a farm animal did create a nearly not solvable problem. Pigs on a farm are raised to give meat to human beings. They will die for our advantage. We want them to be treated in a way that their meat is of high quality, tasty and healthy. This is often in contrast to industrial mass production. Therefore I am against many of its aspects. At the pig research station in Boxberg, which I visited with my Chinese delegation, I have seen the experimental stables, where pigs can go out, have more space. My impression is that those pigs had a better life than those in the conventional raising. I am willing to pay 1 Euro/kg more for t his, because it satisfies my sense for beauty. But I am mostly interested that their meat becomes of high quality, not too lean, not contaminated, a longer life (13 months instead of 6) for getting fatter and tastier. I am willing to pay other Euros more for a kg, if these conditions are met. But I am with the farmer organizations who are complaining that the ban of castration without anaestesis is raising their costs in an unsustainable way. Beside all, the discussion about animal welfare is hypocrite. Farm animals are to serve human needs, We want them to be raised in a way that ensures quality and that does not offend our sense for beautiness, measure and balance. But we inflict inevitably harm to them. We limit their freedom, we force them into specific living conditions and most important: we kill them. All animals kill, at least those which are carnivore. It is a useless and pathetic discussion if you can kill also a plant. But human beings belong to the carnivore part of the animal kingdom. Most animals, which are carnivore, do not kill only to eat, they kill for pleasure. If you have seen a cat playing with a bird or a wolf within a flock of sheeps, you will understand. Within their species many animals kill for fight for power, as more they are genetically near to human beings, as more they do so. Mankind has found pleasure for near all of its history in killing, other animals (hunting for pleasure!) , but even and not least each other. We have now come to a state of development, in which we consider at least killing among each other as something bad. I am very much in favor of this development, but for practical reasons not for moral reasons. With moral considerations I would like to shoot myself a paedophilic priest, who in his sermons condemns abortion and gay people. Nota bene, I would not do, I am against death penalty and I am specifically for the monopoly of punishment limited to the state. But I would not scream a lacrima if someone shoots on Trump or Putin (or Salvini), taking for granted the person who does has to go to jail, because he broke the law. If it would be different, also the person who shoots on me, because I am in favour of gay rights, for women's choice on abortion, free trade and a s mall state, would not be punished. So someone would easily think to shoot on me, and this would be a pity. Nevertheless I have an enormous high esteem of the Peshmerga, women and men, who killed as much as t hey could of these crazy islamic state guys, wo threatened genocide to them. For me life and dead are not separable. Because we live, someone else dies. We have become much more peaceful for the 10000 years of civilization, and I consider this overall good. But at a certain point I stop. I do not want to see humankind ending as described in a fantasy novel I read when I was young, Brains that were swimming in a nourishing liquid and made happy by electric impulses. So I happily assisted my farmer friends and relatives in slaugtering the animals, eating them afterwards with still more gusto.